● Support for new USB-C Macs - Winclone 6 supports cloning and restoring Boot Camp on Apple’s new USB-C MacBook and MacBook Pro models. The USB-C Mac models include disks equipped with a different block size than previous Mac models and most USB drives. 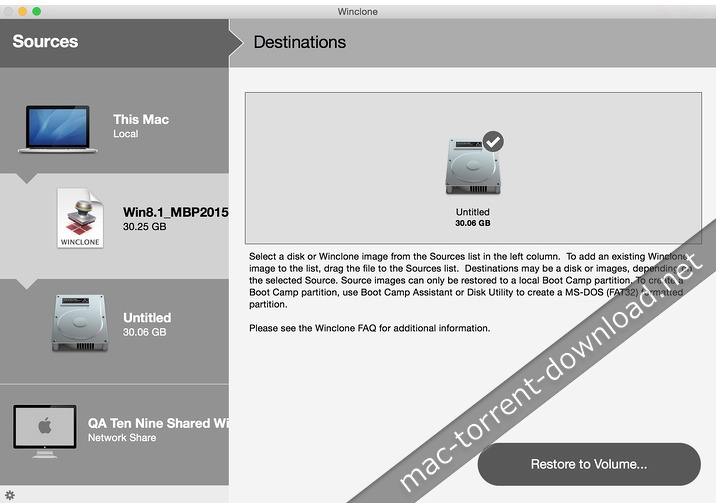 Winclone 6 seamlessly clones Boot Camp between drives of all block sizes. ● Updated Interface - A pleasing new color scheme makes using Winclone 6 easier than ever. ● New Toolbar for Easy Access to common tasks - Winclone 6 improves the easy-to-use interface found in previous versions with a convenient toolbar for easier access to frequently used features and quick access to technical support and tutorial videos. ● In-App purchase of license and upgrades - Choose and purchase the edition that best suits your needs right in the app. When you need the additional power and features, upgrade to Winclone Standard or Pro without leaving the app. ● Read/Write Mounting of NTFS Volumes - Mount Boot Camp or other NTFS drives in read/write mode whenever you need to copy data between Mac and Windows volumes. All editions include support for mounting Boot Camp in read/write mode. ● Better Detection of Windows Version - Winclone 6 improves capability of identifying the Windows version to ensure your Boot Camp is compatible after migration to another Mac. ● Easy Access to Tutorial Videos - Jump straight to Winclone’s reference library of videos to get up and running or explore Winclone’s many features. ● Submit Support Ticket in the App - Need help? Send questions right from Winclone 6 to to get fast, friendly assistance from Twocanoes Software’s tech support team. ● Native Support for the WIM format as well as prior Winclone image format - Winclone 6 supports both block-based and file-based cloning for maximum flexibility and backward compatibility. ● Log Collection Compatibility for macOS - Winclone 6 supports Apple’s new logging format introduced in MacOS 10.12 (Sierra), making diagnostics and troubleshooting easier than ever. ● New Preference for Selecting File or Block-based imaging - Built for novices and experts alike, Winclone 6 makes it easy to integrate Winclone images with other industry standard deployment tools.